Glass Crimes is a photographic experiment in which 25 participants create photograms with pieces of deliberately broken glasses. People from various walks of life, with or without a specialized education in the visual arts, volunteered to take part in the project. The project took place in a photographic lab under red actinic light and in my presence. Each participant had to break wine glasses choosing a tool from the following options: a rock, several paving stones with cubic shapes, a metal rod, a big hammer, a small hammer, pliers, a knife sharpener, a screwdriver, a metal chain. The participants were free to choose the extent of breakage as well as the number of blows: a single one or several blows. 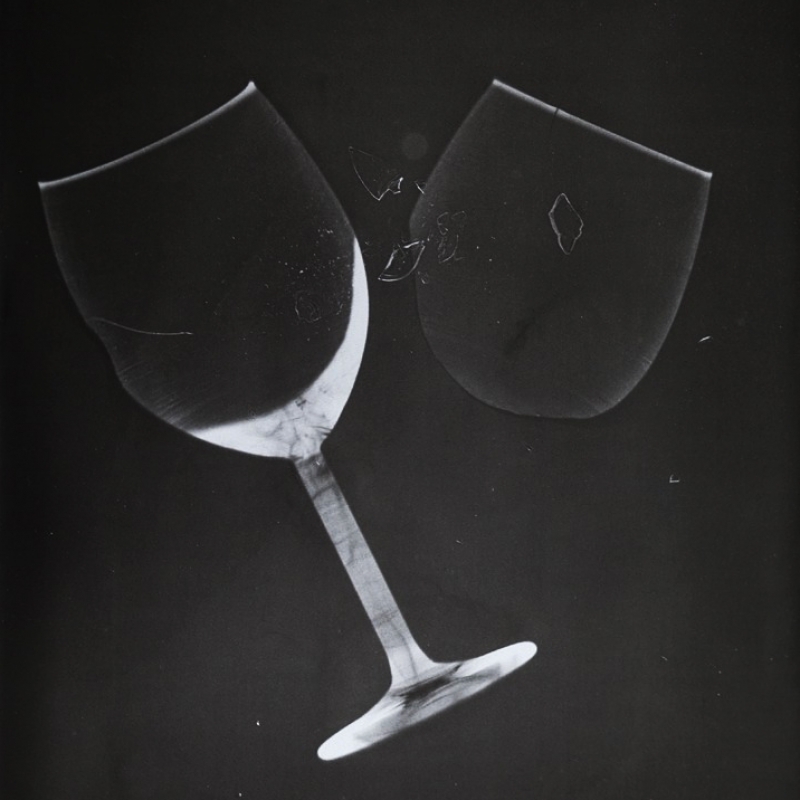 Once the glasses were broken, the experiment continued whereby the participants had to collect the broken glass pieces and create a free composition on black-and-white photo paper which was lit and developed as a photogram. The final selection of the project includes one photogram from each of the participants who also had to come up with a title of their creation. The participants were introduced to the project with a brief explanation of the experiment and the concept for “studying the creative aggression,” provision of safety instructions – the glasses were wrapped in stretch film, gloves and goggles were handed out. As it usually happens with most of the visual methods for studying the psychological, the object of observation proved much more complex than the initially outlined working framework. The strong transgressive element of dealing a blow with a rock on an object on the ground and the desire to achieve wholeness in the process of composing, were the two key and opposite components of the experiment. Several of the participants managed to sublimate the dealing of the blow by making a complex geometric structure with the paving stones to serve as an intercession and create a distance to their act of destruction. On several occasions during the composition time the participants asked me if they could use only one piece. This is another way to overcome the broken and disintegrated state of the object. One of the participants refused to touch the broken pieces of glass and managed to arrange them by carefully lifting the ends of the photographic paper. After the experiment I had conversations with the participants to learn about their feelings and thoughts triggered by the breaking of the glass. It transpired that for many of the participants the experiment was not releasing and liberating and instead caused uncertainty whereby the result of the breaking may get out of their control. For most of the participants the process of arranging the pieces produced pleasant feelings and reflection. The common associations were with observable deviations in the social behaviour, psychological dependencies, obsessive thoughts, forms of physical and verbal aggression. At the end of the experiment, in my capacity as an observer of each of the participations, I created several gigantic photograms by freely creating figures from the big quantity of broken glass, so as to free myself from my own thoughts and tension from the experiment.